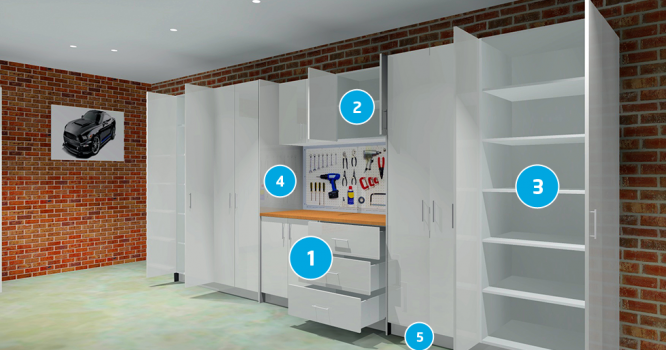 So you’re ready to order your DIY flat packs but need a little bit of clarification on which cabinetry you need? 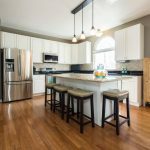 Look no further, here we give you an idea of different areas of your house, and what types of cabinets you may need to help complete your project. To begin ordering your flat packs you first need to register. Often described as the heart of your home, the kitchen is the eclectic centrepiece for food prep, meals and entertaining. 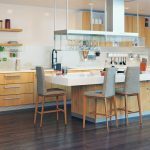 Though the look of kitchens can vary hugely from house to house, they all tend to be constructed from products in each of our categories of cabinetry. Base Cabinets are the foundation of your kitchen. They are cupboards that are placed under a bench top, or stacked in combination with other cabinets (such as tall cabinets) to create unique cabinetry that fits your requirements. 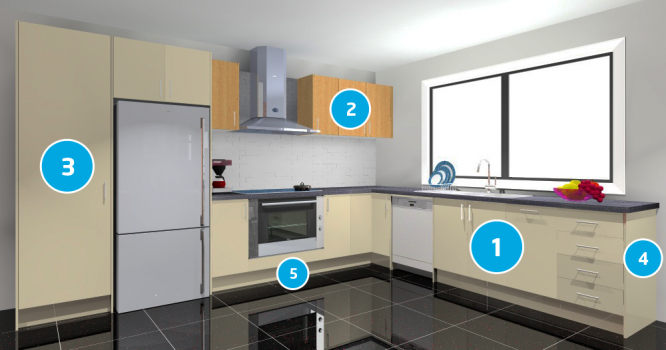 Base cabinets come in a range of variants including units with doors, drawers, open shelving or even units that accommodate ovens and wine racks. Upper Cabinets (also known as Wall or Overhead cabinets) are perfect for getting the most storage space into your kitchen area. These cabinets are typically affixed on the wall above your bench, and come in a variety of single & double door units, open shelving units as well as cabinets to accommodate rangehoods. Tall or Pantry cabinets are normally used as to cover larger areas of your kitchen, and are perfect for storing appliances and more. We have a range of Tall & Pantry Cabinets to suit your needs, including units with doors, inner drawers, open shelving or wall oven units. While typically used in the kitchen, they can also be used for wardrobes, offices and more. Applied Panels are, by definition, panels which are applied to the side of cabinets to which are on the end of a run of cabinets in a kitchen. They are typically made from the material which is the same colour as your doors and create a finished look by covering exposed cabinet carcase panels. 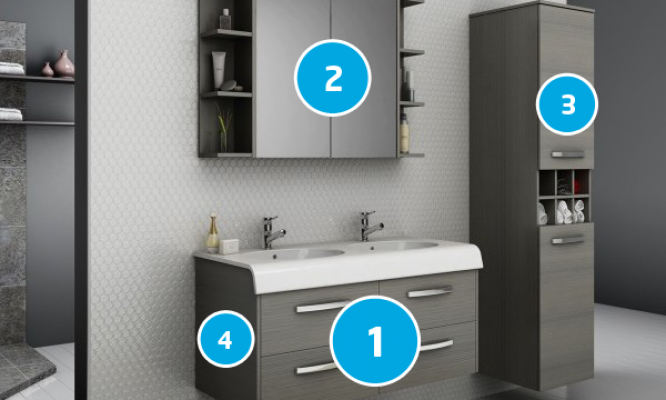 Applied panels can also be used in between cabinetry – for example; the tall cabinet (number 3) in the picture has an applied panel on both of its sides to complete the unit. Without this applied panel, the inside of the cabinet underneath the Upper cabinet would be exposed. If your cabinets are all the same depth and height, and you do not need to create a space in between them, then you will not need to place an applied panel in between cabinets. Kickboard is used to cover the exposed adjustable legs along the bottom of the base cabinets. Kickboard creates a clean finished look to your cabinetry. Whether you’re working with a luxuriously large area or a more modest space, having a custom closet is the thing dreams are made of. 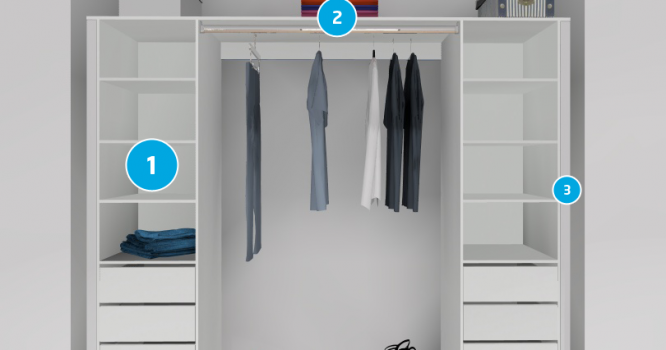 Customise your dream wardrobe cabinetry with goFlatpacks in 4 easy steps. Tall or Pantry cabinets are normally used to cover larger areas of your wardrobe, and are perfect for hanging long garments or stacking on top of a base unit. We have a range of Tall & Pantry Cabinets to suit your needs, including single or double units with doors, inner drawers or open shelving. While typically used in the kitchen, they can also be used for wardrobes, offices and more. Manual panels can be made for inside a wardrobe using carcass board or can be use to complete the top of a cabinet using the colour of your choice. As the bathrooms in new homes get bigger and more luxurious, the smaller bathrooms typically found in older homes are becoming claustrophobic and dated by comparison; it’s not surprising, therefore, that bathroom renovations are high on many peoples’ to do lists. Luckily you can customise your bathroom cabinetry with goFlatpacks and work within your budget whilst still getting high quality products. Base Cabinets are the foundation of your bathroom. They are cupboards that are placed under a bench top, or stacked in combination with other cabinets (such as tall cabinets) to create unique cabinetry that fits your requirements. Base cabinets come in a range of variants including single or double units with doors, drawers or open shelving. Upper Cabinets (also known as Wall or Overhead cabinets) are perfect for getting the most storage space into your bathroom area. These cabinets are typically affixed on the wall above your bench, and come in a variety of single & double door units or open shelving. Tall or Pantry cabinets are normally used as to cover larger areas and are perfect for storing linen if you have a shared bathroom / laundry. We have a range of Tall & Pantry Cabinets to suit your needs, including units with doors, inner drawers, open shelving or wall oven units. While typically used in the kitchen, they can also be used for bathrooms, offices and more. Applied Panels are, by definition, panels which are applied to the side of cabinets to which are on the end of a run of cabinets in a bathroom. They are typically made from the material which is the same colour as your doors and create a finished look by covering exposed cabinet carcase panels. 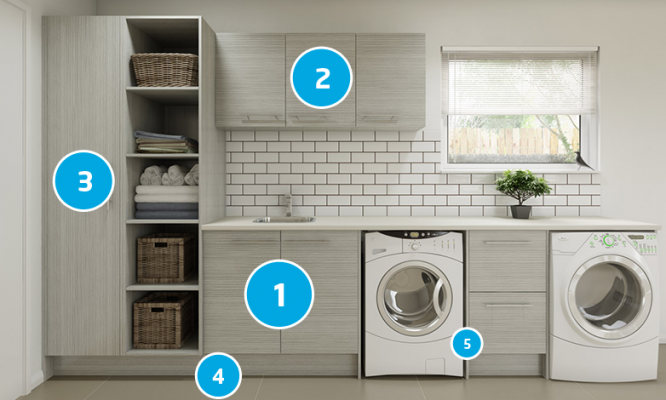 A well-organised laundry with plenty of cabinetry can make washing & folding clothes a breeze. We have a wide range of colours to choose from to help make your laundry inviting, whilst also being practical and hard working for you. Base Cabinets are the foundation of your laundry. They are cupboards that are placed under a bench top, or stacked in combination with other cabinets (such as tall cabinets) to create unique cabinetry that fits your requirements. Base cabinets come in a range of variants including single or double units with doors, drawers or open shelving. Upper Cabinets (also known as Wall or Overhead cabinets) are perfect for getting the most storage space into your laundry area. These cabinets are typically affixed on the wall above your bench, and come in a variety of single & double door units or open shelving. Tall or Pantry cabinets are normally used as to cover larger areas of your laundry, and are perfect for storing linen and more. We have a range of Tall & Pantry Cabinets to suit your needs, including single or double units with doors, inner drawers or open shelving. While typically used in the kitchen, they can also be used for laundries, wardrobes and more. Applied Panels are, by definition, panels which are applied to the side of cabinets to which are on the end of a run of cabinets in a laundry. They are typically made from the material which is the same colour as your doors and create a finished look by covering exposed cabinet carcase panels. Is your garage a mess? If so, perhaps it’s time to declutter and reorganise the space to make it functional and mess-free. Having enough cabinetry for all your bits and bobs is a good start! Custom design your own or use our templates as a guide. Base Cabinets are the foundation of your garage. They are cupboards that are placed under a bench top, or stacked in combination with other cabinets (such as tall cabinets) to create unique cabinetry that fits your requirements. Base cabinets come in a range of variants including single & double units with doors, drawers or open shelving. Designing the right cabinetry could mean the difference between a ho-hum office and one that’s productive. At goFlatpacks, we believe if you work hard, so should your office. 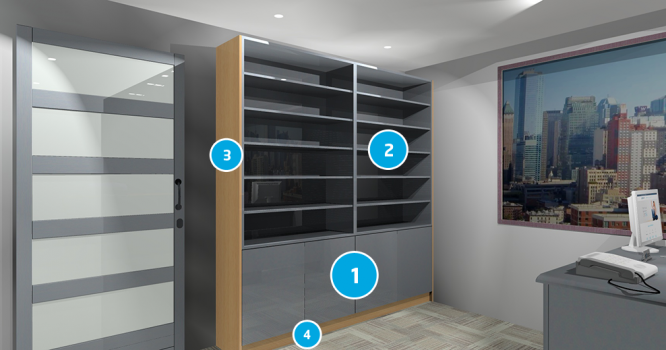 Consider where you will store those important documents – cupboards, shelves or drawers when designing your cabinetry. Base Cabinets are generally the foundation of your office. They are cupboards that are placed under a bench top, or stacked in combination with other cabinets (such as tall cabinets) to create unique cabinetry that fits your home / office / library requirements. Base cabinets come in a range of variants including single & double units with doors, drawers or open shelving. Upper Cabinets (also known as Wall or Overhead cabinets) are perfect for getting the most storage space. These cabinets are typically affixed on the wall above your desk, and come in a variety of single & double door units or open shelving units. Applied Panels are, by definition, panels which are applied to the side of cabinets to which are on the end of a run of cabinets in a office or study. They are typically made from the material which is the same colour as your doors and create a finished look by covering exposed cabinet carcase panels. 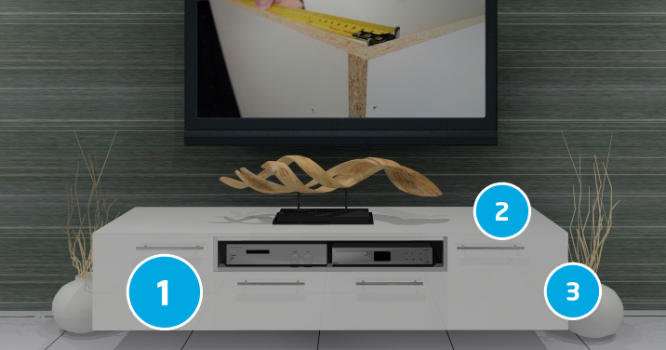 Don’t let your television dominate a room. Customised innovative cabinetry can hide it away or bring it into focus on a whim. Base Cabinets typically are cupboards that are placed under a bench top, or stacked in combination with other cabinets (such as tall cabinets) to create unique cabinetry that fits your requirements. But they can also be used on their own and can be completely customised to the size you need. They come in a range of variants including single or double units with doors, drawers or open shelving. A manual panel exterior is a panel to suit your sizing. This is used to complete your cabinet and is made from your chosen colour.